I came home from my roadtrip last week and decided to take a few days off from the blog. It was a pretty good trip, even with some iffy weather for travelling, that crossed some of the flat, open farmlands of the midwest. Heartland. On this trip, I was especially encouraged by my visit to Watts Fine Art. The gallery is located in Zionsville, a bedroom community just a bit north of Indianapolis. The village is a lovely place having a compact and very inviting commecial district with brick-paved streets lined with shops, galleries and restaurants. Just a charming and very comfortable place. I was especially pleased with the gallery. It is a great space and the owners, John and Shannon Watts, have assembled a very eclectic mix of talented and very distinct artists from around the country. As an artist, I am always concerned with how my work fits in with a gallery’s lineup of other artists, desiring a high level of quality as well as a variety of styles. Even though I might feel confident about the strength of my own work, I realize that the overall strength of a gallery’s talent affects how those who come into the gallery view my work. I always like to be hung near what I consider the best work in a gallery, believing that a gallery is remembered either by its best work or its weakest. I prefer to be surrounded by the better work. I was really pleased with the group of artists at Watts Fine Art. They came from many differing genres and all had very distinct styles and voices. I immediately felt that my work would fit well within this group. Although I liked almost of the work there, there were several that really stood out for me. 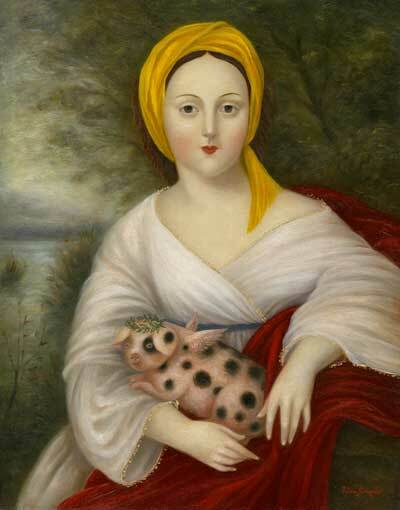 For example, they had a couple of beautiful pieces from Fatima Ronquillo , a self-taught artist now residing in Santa Fe, that have the feel of the fine folk art portraits of the 19th century mixed with a sense of whimsy. Beautiful surfaces. Shown to the right is her Lady With a Marvelous Pig, a painting that my eyes kept coming back to during my visit. 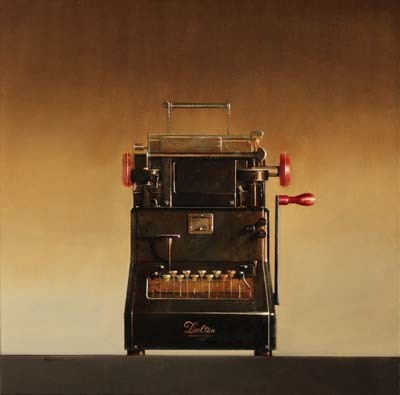 I also really liked the moods created by the paintings of Wendy Chidester, a Utah artist whose beautifully rendered still life pieces often evoke a sense of nostalgia. Old typewriters, adding machines and vintage luggage populate her pieces and allow you to find something more beneath the surface appearance of these objects. They also have beautiful surfaces. Shown to the left is her Dalton on Brown. There were several more artists who I could easily point out here but I think these examples will suffice for now. Just really good stuff. I am pleased and honored to be hanging alongside this group of artists, glad to be well represented in the heartland. I’m on the road for the next couple of days so check back later for the next post here. I’m heading out to the Indianapolis area where I’m delivering a new group of work to Watts Fine Art, a gallery located in Zionsville, a suburb of Indy. I’m excited to visit this gallery and to meet the owners, Shannon and John Watts, face-to-face for the first time. One of the paintings that will be heading to Indiana is this new piece, Enduring the Storm. An 18″ by 26″ painting on paper, it’s a piece that is really carried along by color and texture, both attributes having a heightened intensity here. 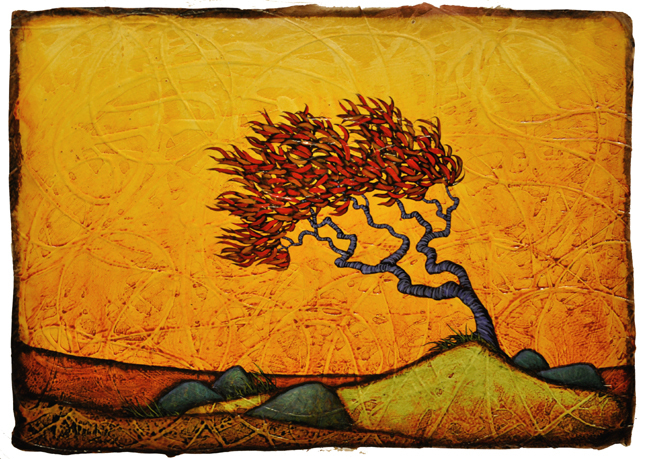 The composition’s simple design allows the yellows to shine and the thick whorls of the gesso base contrast dramatically off the red crown of the tree as it flails in the wind. Simple and strong. I will be back soon. Check back in a few days and have a great week. 2012 is going to be a very exciting year for me– and not only for the Mayan Apocalypse. I have three solo shows at the galleries that represent my work all set around my upcoming exhibit, Internal Landscapes: The Paintings of GC Myers, at the Fenimore Art Museum in Cooperstown which runs from August 17 through December 31 of this year. There will also be four gallery talks, including one at the Fenimore in November. So, as I say, it looks to be a busy and exciting year. Also new this year is an energetic Midwest gallery that will begin representing my work beginning later this month. 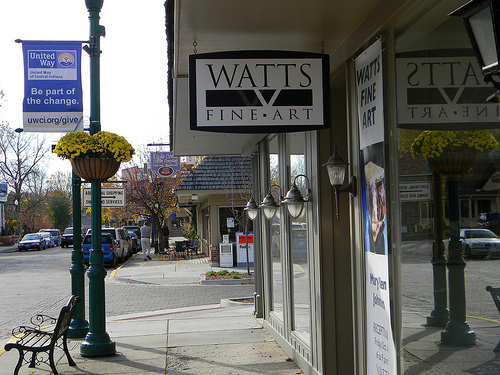 Watts Fine Art opened in 2010 in the historic district of Zionsville , a suburb of Indianapolis with tree-lined brick streets. It is ran by Shannon and John Watts, a young couple who retired a few years back from extremely sucessful corporate careers and decided to make their passion for art their newest life adventure in the form of a gallery dedicated to bringing the very best contemporary art to the Midwest. Shannon and John have a palpable excitement for the work they represent which is something that, as an artist, you hope for in the gallery staffs that represent your work. Their enthusiasm for their gallery and the possibility of showing my work there was key in my decision to join with them. They also have a wide and long-range vision for their gallery, wanting to introduce collectors throughout the entire Midwest with their collection of artists from around the country. I am really pleased and enthused about joining their gallery and having Shannon and John represent my paintings. So, with all of this on my plate, I guess I should get back to work!